overthrown.” Notice what was said of the people of Nineveh in verses 5 and 6. They believed in God. From the greatest to the least of them … they put on sack cloth. Do you see what their king did? He called the people to fast and turn from their wicked ways. President. His first act as President was to lead the members of the Senate and House down the street to a little chapel called St. Paul. By example, they led our nation in prayer. The bells tolled in New York City from 9:00–9:30 a.m. calling the inhabitants of the city to pray for the newly formed government. Flash forward. On September 11, 2001, terrorists drove planes into the twin towers, toppling the symbol of our economic power. 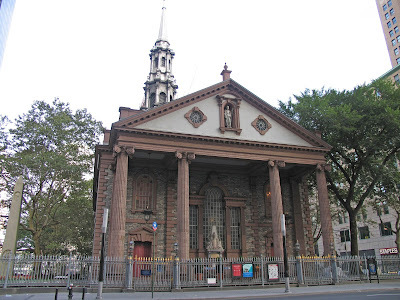 However, one structure at Ground Zero stood untouched: St. Paul’s Chapel, the place our founding fathers prayed, and the symbol of America’s dedication to God. Yes, the symbol of our economic power toppled but the symbol of our dedication to God remained. God in His mercy is calling us to repentance. How long we have is not known. Pray for this nation, like Nineveh, to heed the warning and avert judgment. Pray for leaders who will call the nation to prayer and repentance.